Ik ben een jonge Schotse dichter! 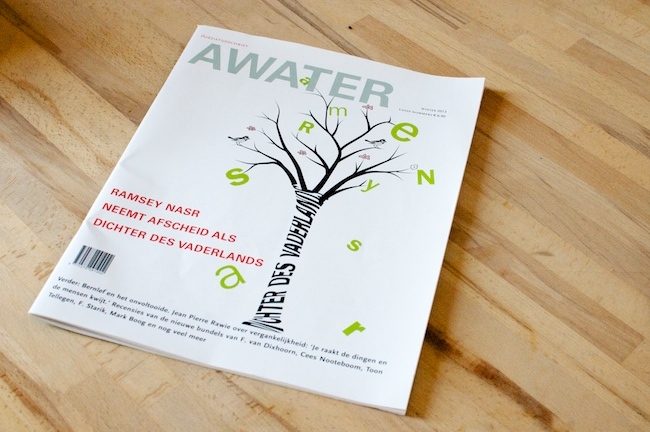 I have been very excited about the translation of one of my poems into Dutch for the magazine Awater, the largest literary magazine in the Netherlands, alongside three poets featured in the Scottish Poetry Library‘s Best Scottish Poems 2011, Jen Hadfield, JL Williams, and Charlotte Runcie. I’m very flattered to be placed in such intelligent and talented company. The translator is Susan Ridder, who has translated prose, poetry and non-fiction for a range of literary magazines, and has also done translations for the Stedelijk Museum ‘s Hertogenbosch, Monali Meher, Philip Stromberg, and Movies that Matter. A week ago, the magazine dropped through my door, and imagine my delight as Mat and I struggled to puzzle out the surrounding article in our tourist Dutch, to find the featured poets described as “vier jonge, Schotse dichters” – four young Scottish poets! That’s a nice thing to read just after your 40th birthday. There is nothing like seeing your poem in another language – though the poet in me was of course nervous at the lack of control over words used, for example “kwikzilveren” for mercury. But the whole point of writing is that once you have let the thing out of the door, its meaning and message is the property of its readers, if you are lucky enough to get any. And it is quite something that you will have intelligent readers in another country, who unlike me will have the knowledge of both languages to compare the two versions, if they want to. All I can do is enjoy the music of the sounds of my poem in this language, which certainly seems to evoke the landscape it’s meant to describe. The full poem in Dutch is below. You can read the English version here. The poem was originally published in New Writing Scotland 29. Maar onderdeel is van een archipel. Door de stromingen die de mijne vinden. Oorspronkelijke titel: Mourning in Arduaine, gepubliceerd in New Writing Scotland, 29 (2011) Translation: Susan Ridder for Awater. Below, for anyone who’s really interested, is the English translation of the full article by Susan herself, with the four poems in the original. A lovely article, though the time taken to publish it, plus translation, means there are a few inveracities – for example, I am now one of last year’s Clydebuilt cohort, though we are reading this year at Mirrorball (April 18th at the Art Club). Also, for the record, it was a 1969 VW Campervan we got stuck in the mud in, not a car, and one complete with bed and kettle, so not too much hardship to wait overnight, and of course I felt suitably philosophical in the morning! We got stuck there in the dark, so the view in the morning was a revelation, and the poem came quite easily for once. It can be good to be forced to stay still, when you’re as hectic as me. My 40th birthday was spent with my man and two boys in the beautiful village of Crail on the Fife Coast, and immobilised by flu. Here’s hoping for a similar level of literary output from that! Susan Ridder has lived in Scotland for several years and still visits regularly. She’s translated four fascinating young Scottish poets for Awater. This is the Dutch premiere of their work. According to Dorothy McMillan, Honorary Senior Research Fellow English Literature of the University of Glasgow and editor of, amongst others, Modern Scottish Women Poets (Canongate, 2003), Scotland is a good place to write poetry, whether you’re Scottish or not, but not such a good place to get it published. There are a number of small independent publishers in Scotland with an impressive poetry list, including diehard publishers, Luath Press and Mariscat Press, but the most important poetry publishers, like Carcanet Press and Bloodaxe, are based in England. The largest Scottish publishing house, Canongate, stopped publishing poetry several years ago. However, a considerable number of pamphlets (comparable to Dutch chapbooks) are published in Scotland, for instance by HappenStance Press, Calder Wood Press and Red Squirrel Press, and there are countless poetry events, readings, poetry slams and poetry competitions. As there is no obvious source on contemporary Scottish poetry and most books and articles are about the big names, I started my search for contemporary work on the website of the Scottish Poetry Library (www.scottishpoetrylibrary.org.uk), a unique poetry library in Edinburgh, whose staff specialise in the promotion of poetry, particularly Scottish poetry. The SPL’s extensive website is a treasure trove of information about Scottish poets and their work, including a list of the twenty best Scottish poems of 2011, compiled by Scottish poet Roddy Lumsden. (Every year the list is drawn up by a different person.) Based on this list, I chose the following poems for translation: ‘Staying In’ by Charlotte Runcie, ‘Taboo’ by Jen Hadfield, ‘Imago’ by J.L. Williams and ‘Mourning in Aruduaine’ by Ellen McAteer. The first three poems are on the list, Ellen’s work I knew before I went looking for the other poems. Ellen McAteer is a poet and song writer working for the Glasgow School of Art. She took part in the Clydebuilt Verse Apprenticeship Scheme, where her mentor was poet Alexander Hutchison, and this year she is one of the St Mungo Mirrorball/Glasgow Life ‘Clydebuilt Poets’. She’s been a member of the Scottish poet Donny O’Rourke‘s Poetry Group and a director of the Scottish Writers’ Centre. Her experience is that the poetry scenes in Glasgow and Edinburgh are quite separate, although every once in a while they are united by the Scottish Poetry Library. Ellen’s poems have been published in magazines like New Writing Scotland, Gutter and Aesthetica and in the anthology Tip Tap Flat: A View of Glasgow. The most well-known of the four poets is Jen Hadfield, who already has two poetry collections to her name, published by Bloodaxe, one of the most important British publishers of poetry today. Like Charlotte Runcie, she has been awarded several prizes, including the TS Eliot Prize 2008 (for her second collection Nigh-No-Place). And, like her colleague JL Williams, she did the MLitt in Creative Writing at the University of Glasgow. Although now based in Shetland, she grew up in Cheshire, England, and has many relatives in Canada. As a result of her international background, her work is often influenced by the contradictions of travelling and being at home, and the importance of place and country. JL (Jennifer) Williams also isn’t Scottish by birth, she’s from New Jersey, but like Charlotte Runcie, she now lives in Edinburgh. She is Programme Manager for the Scottish Poetry Library and her work has been published in magazines like Poetry Wales, The Wolf, Shearsman, Fulcrum and Stand. In 2009 she travelled to the Eolean Islands with a travel bursary from the Scottish Arts Trust. There she wrote ‘Imago’, which was published as part of her collection Condition of Fire (Shearsman Books, 2011). What appeals to me in the poems I translated is that all four are very visual, but at the same time have something mysterious. Charlotte Runcie’s poem was written on a rainy afternoon in Cambridge, but the image of a rainy reality has been overlaid with a dream image of Edinburgh in the snow. When Charlotte wrote the poem, she was still a student, working on a dissertation about Romantic sonnets, a form that fascinated her. She discovered that it can be very useful when balancing the concrete and the abstract, and to overlay multiple images. She says the sonnet also reflects her image of Edinburgh on New Year’s Eve – a city with stark architecture that contrast strongly with the fire works, unpredictable weather and somewhat sad drunkenness of many of its citizens on that night. The poem was meant as a window through which you can see Edinburgh in the distance, as she saw the city when she lived in England. Jen Hadfield’s poem is about hares in the snow, but it was written as a riddle: the reader has to guess the animal referred to. As she herself says, she is currently particularly interested in riddles and the parallels between the old Shetland riddle game called ‘guddicks’ and the reader’s fear of not ‘getting’ a poem. She often doesn’t understand riddles herself, and she still worries about understanding poems, so she doesn’t want her own poems to be ‘difficult’, she’d rather communicate. However, when she attempted to simplify her poem ‘Taboo’, the rhythm became flawed and the life seeped out of it. What is striking about Ellen McAteer’s poem, I think, is how beautifully she describes a – to me quite familiar – landscape, that of the Scottish west coast, and how the poem conveys her grief at the loss of her father. The poem is about coping with that grief, in which the poet doesn’t believe in life after death, but rather in the idea that her father’s life continues to influence that of her and her family, even though she cannot see him anymore. The poem is also about the fragmentation of families. Ellen’s inspiration for this poem came when she and her partner were stuck in the mud in their car one night, after a picnic. As they had to wait until someone could come and help them the following day, they decided they might as well go to sleep. When they woke, they were treated to the most stunning sea view ever. JL Williams’ poem conveys something intangible through its title and first stanza, which refer to the last stage in the life of an insect, after its metamorphosis. Williams then links this metamorphosis to the creation of heaven and earth as imagined by Ovid. The poem was written when, during her Masters in Creative Writing, she and writer Elinor Brown made an attempt to write their own version of Ovid’s Metamorphoses. That version never really worked out, but Williams remained interested in Ovid’s stories about transformation, an interest that became the basis for her application for the Edwin Morgan Travel Bursary. With that bursary she travelled to Salina, one of the Eolean Islands near Sicily, where she wrote the poems that were published in Condition of Fire, one of which is ‘Imago’. With many thanks to Lizzie MacGregor of the Scottish Poetry Library, Dorothy McMillan, Ellen McAteer, Charlotte Runcie, Jen Hadfield and JL Williams. I watch the city shrug its clothes back on. a pearlish weeping reaching for the roots. in and round the world. that snaked and pooled and froze, in places, rose. The winds, his children, he banished each to their rooms. creatures with eyes looking upwards, who walked dreaming. This entry was posted in Poems, Publication, Uncategorized and tagged Awater, Awater magazine, charlotte runcie, Dutch, Dutch language, English language, Jen Hadfield, jl williams, literature, poetry, Pozie, Scotland, Scottish, scottish poetry library, translation. Bookmark the permalink. 3 Responses to Ik ben een jonge Schotse dichter!